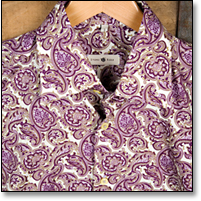 As you begin to refresh your closet, consider one of the new shirts from Miami-based Stone Rose. Inspired by the owner's eclectic heritages, each look in the new collection is named after a corresponding airport code. While the DXB (Dubai International) is rich with floral and paisley prints (pair it with supreme confidence), the BCN (Barcelona) is the most formal, with stripes and a white collar. And then there is the top-seller, MIA. It's lively, full of color and has several different accents. Although you'll still do most of the talking.